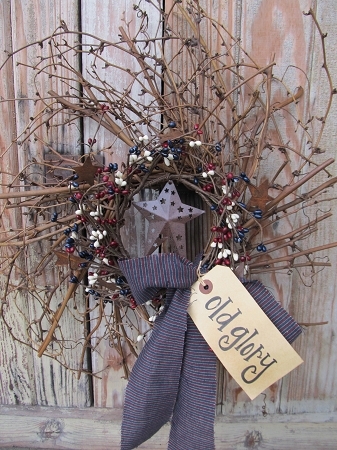 Americana Grapevine Twiggy Pip Berry and Stars Wreath. This is my Americana twist of my Twiggy pip wreath in Primitive Floral. This one features an Americana colored pip berries with rusty metal stars wreath with a rusty star hanging in the middle. I've then added some patriotic homespun fabric for the bow and tied on a primitive tag, that you can customize with your favorite saying from the list. Fabric and stars may vary slightly depending on availability. Pip berries are not really meant for outdoor use, they tend to pop open and turn white. This wreath would work best on front doors with a screen/glass door in front or hung on a wall or wreath stand. Assembled by Heidi.